Narwhals, the toothed whales that inspired the myth of the unicorn and live in the Arctic, have proven to be adept field techs, helping scientists collect data from remote depths of the Arctic Ocean in Baffin Bay off the west coast of Greenland. In the November issue of Journal of Geophysical Research-Oceans, oceanographer Kristin Laidre of the Polar Science Center in the Applied Physics Laboratory at the University of Washington reports that her team successfully outfitted 14 narwhals with thermometers and satellite transmitters, and the animals recorded comprehensive coverage of the bay, between Canada and Greenland. Laidre worked in Baffin Bay with colleagues and co-authors Mads Peter Heide-Jørgensen from the Greenland Institute of Natural Resources in Nuuk, Greenland, and Wendy Ermold and Michael Steele also from the Polar Science Center, University of Washington. Diving to depths of up to 1,773 meters, the narwhals reached locations that are essentially off limits to humans. Extreme temperatures, ice floes and other hazards make studying this region in the winter (narwhals collected data during the winters of 2005, 2006, and 2007) nearly impossible. The data documented a warming trend in ocean temperatures that is associated with a warmer West Greenland Current, but the primary accomplishment of the work was establishing that the animals can be used for research, said Laidre. "The proof of concept that the narwhals can help take measurements is what's really remarkable," she said. "The idea that we could use these narwhals as a platform to study the ecosystem itself is significant." Laidre and her team captured narwhals by suspending nets in the ocean and watching them constantly. Finding the animals proved challenging. "It is not easy or straightforward to capture whales," she said. 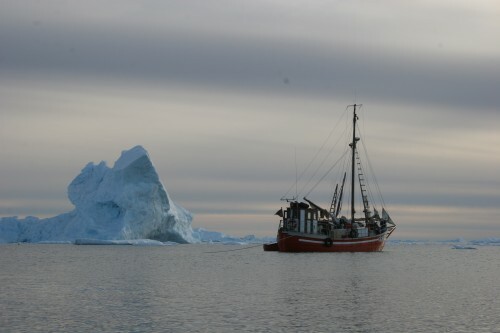 The team sailed from northwest Greenland into remote sites with no inhabitants, and then they dropped nets and waited. And waited. "We had to try a lot of sites before we could find a site to catch the whales," said Laidre. "We were in an area notorious for icebergs, and there were enormous amounts of ice floating by and taking the nets with them." When a narwhal got caught in the net, team members would pull it to the surface and suspend the net between two zodiac boats. They would temporarily restrain the narwhal, quickly tag it, and release it. The "tags" are roughly the size of a deck of cards and were affixed with a block of epoxy to the narwhals' dorsal ridge, which consists of cartilage and blubber. After a period of three to eight months the tag would fall off. The captured narwhals measured on average 15 feet long and weighed approximately 1,600 kg (3,000 lbs). The team captured the whales in September before they migrate south, away from their summering grounds that get locked in with fast ice in the dark winter. Once the animals reach their wintering ground they spend about six months feeding on Greenland halibut at the bottom of Baffin Bay. The fishing requires narwhals to dive 800 to about 1,500 meters. 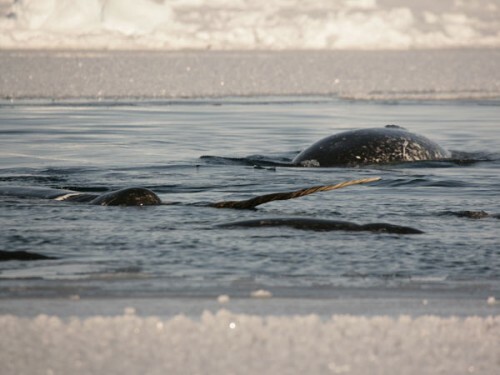 The narwhals essentially allowed scientists to conduct more thorough and less expensive research than conventional measures; traditionally, attempting to collect that data would have required an ice-breaking vessel and other specialized equipment and would have cost millions of dollars. Due to the Baffin Bay data gap, researchers used climatology data consisting of long-term historical average observations for the past decade rather than direct ocean temperature measurements for winter temperatures in the area.